Prima Marketing has a new monthly challenge this year, "Make it Prima! "and it's pretty cool! I stated by adding a thick layer of light paste to a canvas, and then I pressed a vine stencil into the paste for an embossed look. I then added Peony and Cotton Candy Color Bloom sprays. I used some Sparks paint (Butterfly Spells, which is a BEAUTIFUL light rose color) and waxes in Rose Gold, and Aged Brass, as well as some Artisan Powders in black and Mahogany Teakwood on the resin frame. 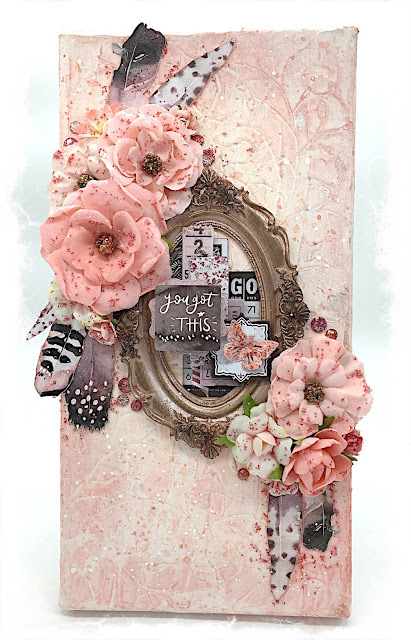 Inside of the frame are pieces from the Rose Quartz ephemera pack. I also used a butterfly from the Mechanicals line that I gessoed and sprayed with the Cotton Candy and Peony sprays. I fussy cut out the feathers form the Rose Quartz 12X12 and journaling card papers, and stuck those under the pretty Rose Verona flowers, also from the Rose Quartz collection. I also snuck in some small roses (Lovelies). 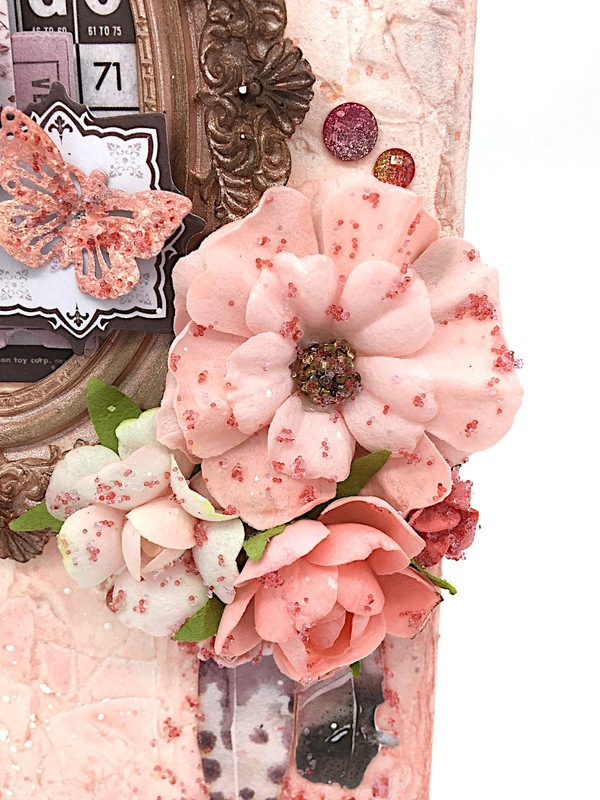 Next, I added some Say it in Crystals from the Love Clippings collection, and then used Blush micro beads on the flowers, butterfly, and feathers. I finished off the canvas by adding some splats of white gesso and the pink sprays. Thanks for checking out my project! I hope you have a lovely day!